Professional development can take many forms. The most powerful professional learning is relevant and actionable. I’m so excited to share a new online course from a former colleague and fellow Participate author. Finding Success in Your Co-Teaching Partnership is now open for enrollment, and you’ll want to check this out! As a classroom teacher, I had the opportunity to teach in a co-teaching placement. Working with another teacher in this arrangement was a rewarding experience. But just like anything new, I wish I had more support at the time to be my very best and make the most of this partnership. Tammy Musiowsky is a former colleague and classroom teacher now based in Singapore. We taught in the same school for several years, and I had the chance to see Tammy’s co-teaching expertise in action. She is a dedicated professional and the newly elected president of the ASCD affiliate for Emerging Leaders. She has developed a course for educators who want to strengthen their co-teaching partnership. Carving out time for professional development during the school day can be a challenge. Even harder is finding relevant learning opportunities related to your professional goals. What I love about the self-paced online courses from Participate is how easy it is to dive in. You can move through the content on your own schedule when the time is right. From videos and audio recordings to opportunities to put your learning into action, self-paced online courses can help you make the most of your professional learning. With online courses, you can pick and choose what content you want to learn. After finishing a course successfully, you can even earn a digital badge to show off on your social media platforms or professional channels. Tammy Musiowsky has created a new online course focused on co-teaching. If you want to become a stronger co-teacher, you’ll want to check it out! 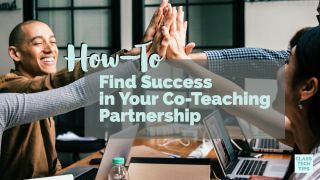 Finding Success in Your Co-Teaching Partnership provides actionable strategies for educators at any stage of their career. Tammy was kind enough to answer a few questions to help us learn a bit more about her new course. What inspired you to create a course on this topic? From the start of my career in education in 1998, I’ve always worked in classrooms with more than one adult. And in that time I’ve watched teachers, assistants and co-teachers work together to ensure they’ve met student needs. For eight years in New York City, I taught in a collaborative co-teaching environment, learning the basics with partners as well as experiencing an evolution in our teaching over the years. The last three years, I’ve been watching the inclusion movement evolve in the international school scene in Singapore and throughout IB schools, as teachers are learning more about co-teaching and effective team teaching practices. There seemed a bit of a gap in professional learning options for teachers to reflect on teaching and dig into the depths of quality co-teaching partnerships. Why is this topic essential for educators to explore? All teachers will at some point in their careers, have a co-teacher. Teaching partners may be full-time, as they can be in elementary. Co-teaching partnerships may also include a teacher pushing into classrooms to support students with learning plans or with their language development. Many times, those are not developed enough to maximize the teacher’s skills to enhance the learning experience for students. Developing strong partnerships is essential to effectively meet needs all learners. Any school staff member working in classroom settings would benefit from taking this course. As well as school administrative teams as they are the instructional leaders in schools. What will someone find in your course? Participants will interact with a wide range of media and will engage in different kinds of thinking activities. Videos, curated articles and blogs, a guest speaker podcast, and activity templates have been created to ensure that the course is well-rounded and has depth. What do you hope educators will walk away with after completing this course? I hope that educators will come away from the course having deeply reflected on the complex work of co-teaching. I hope that educators find value in the content and the related activities. They can share their insights throughout the course on Twitter (#ParticipateCoteach) as a way to start developing their own Professional Learning Communities. And of course, I hope that anyone who takes the course enjoys it, and is excited to build or rejuvenate their co-teaching partnership to support their students. Finding Success in Your Co-Teaching Partnership is now available on the Participate platform. Click here to learn more and sign up for this self-paced course!